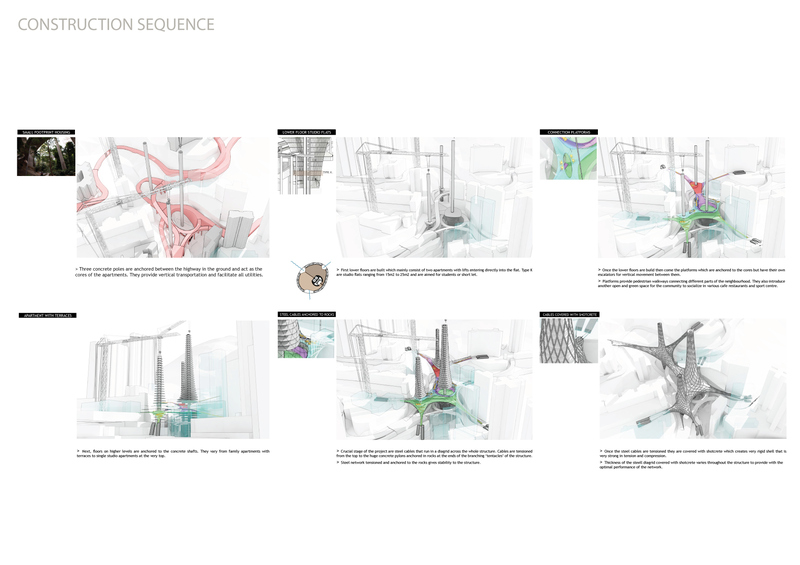 Intermediate Unit 6 investigates the critical application of innovative digital design and construction processes within the context of the challenges that cities face today. 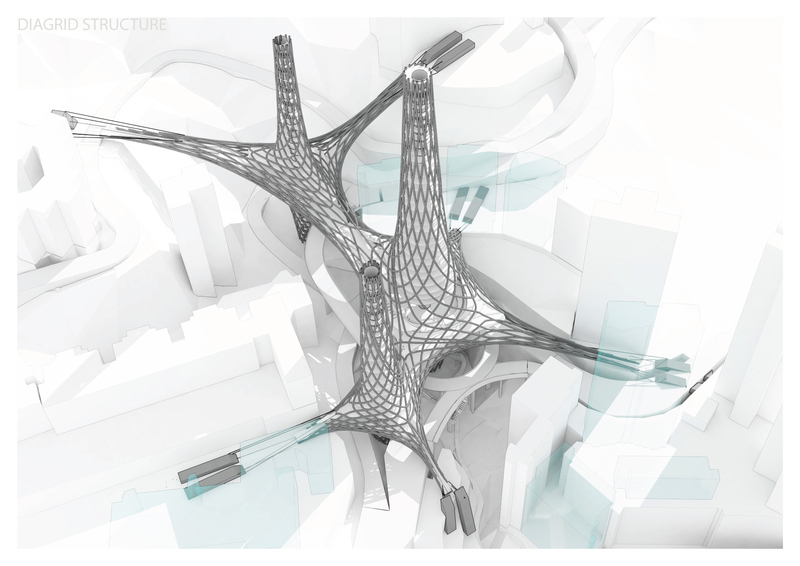 Deploying fabrication-based design strategies within dense urban environments, we will develop architectural structures that negotiate their spatial and material configuration w ithin contexts of limited resources, infrastructure and space. 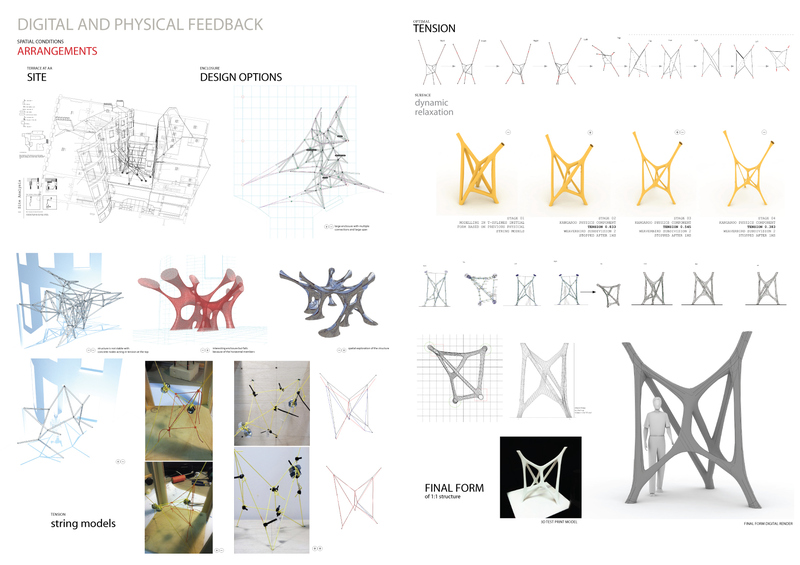 Structuring the year into tw o interdependent phases, students w ill w ork collaboratively on the design and construction of 1:1 scale prototypes, as w ell as individually on the development of projects addressing contextual aspects such as program and site. 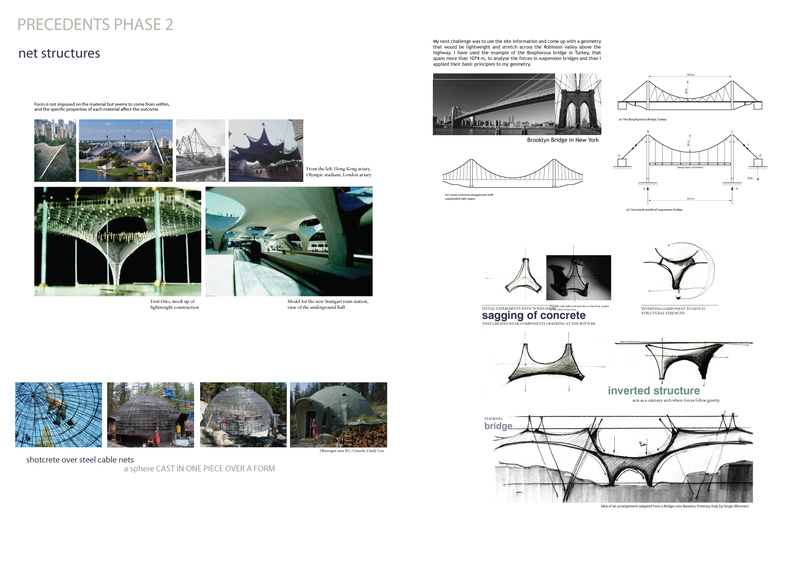 My research into developing fabrication-based strategy within dense urban environments was split into two phases. 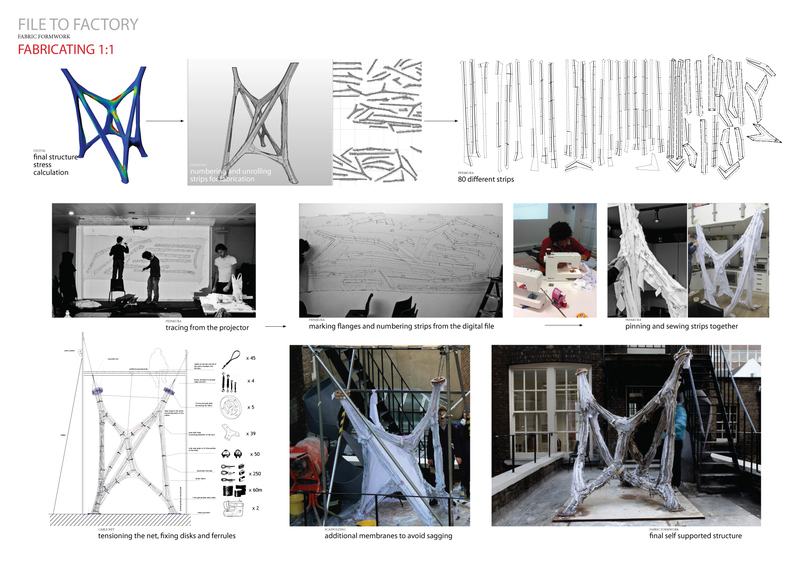 In term one ‘’In Vitro’’ I have worked on a physical prototype of a system of steel cable network with fabric formwork that is tensioned and then set with concrete to create an enclosure. 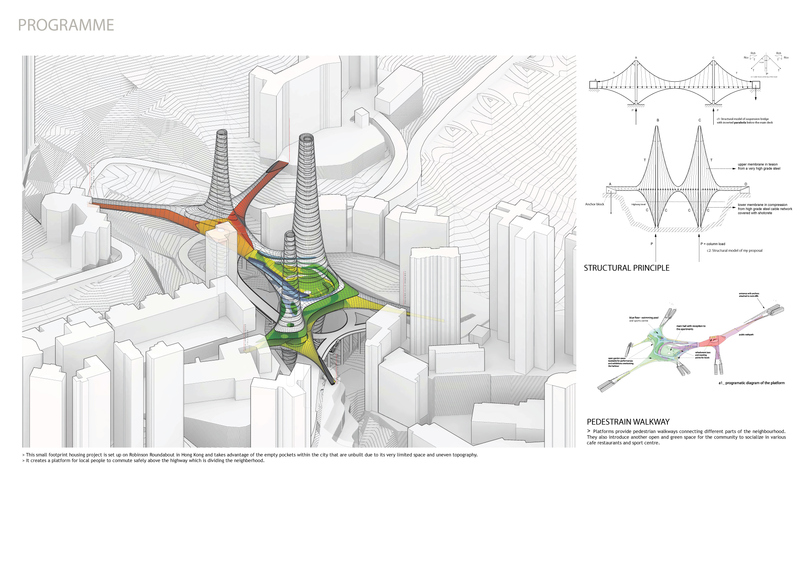 In second phase of the project ‘’In Vivo’’ I put the concept to the test by applying towards inhabitable bridge within a dense\complex site in central Hong Kong. 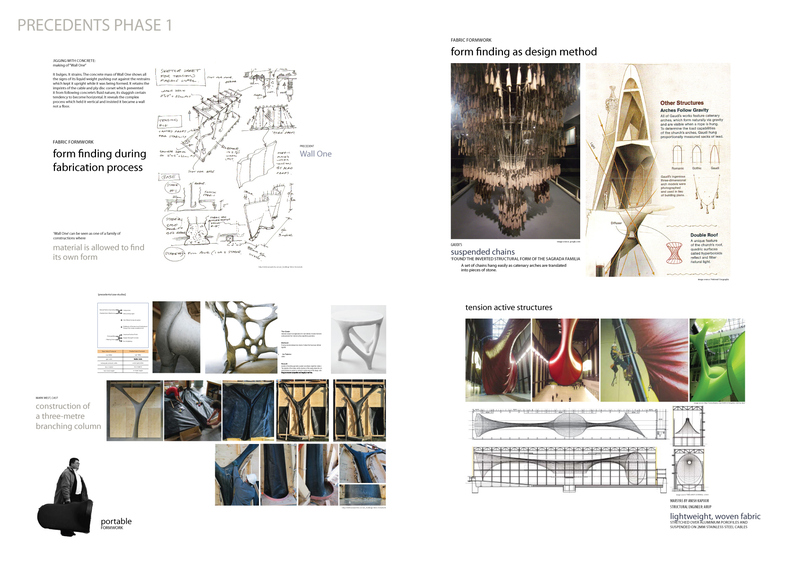 My phase one research with a team begun looking at precedents that use form finding during fabrication process like Mark West three metre branching columns made using fabric formwork. And form finding as design method like Gaudi’s suspended chains that under gravity and evenly distributed load form catenary arches that could be later translated into stone. We also looked into tension active structures like Anish Kapoor installation in Tate Modern made out of lightweight woven fabric. Detail of a single node taken down from the tensioning rig, still with the fabric and disks on. Digital and physical feedback was very important during our design process of the 1:1 prototype. 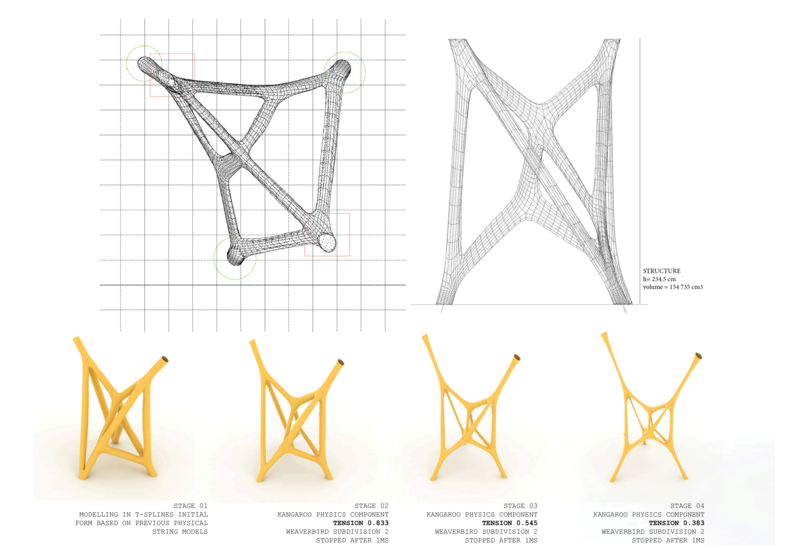 We have made many variations of the arrangements using physical string models stretched on the site to test for anchorpoints; number of nodes joining at one vertex; compression and tension members. 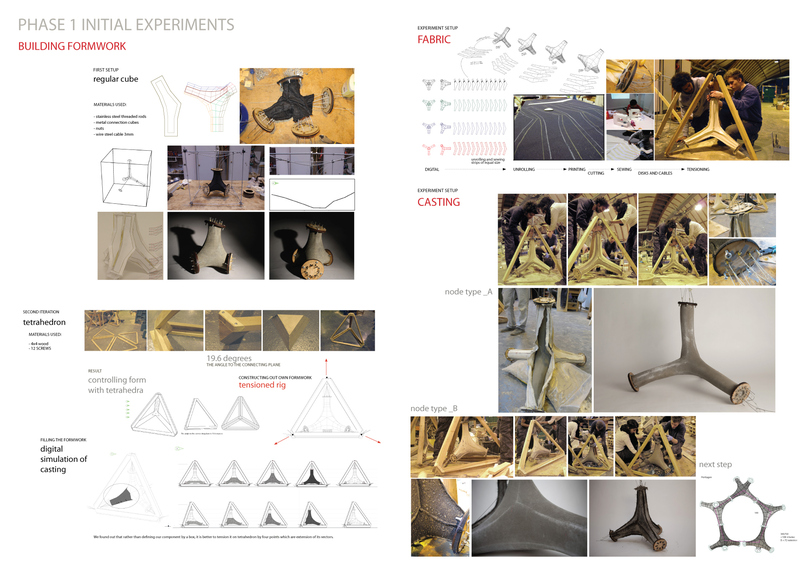 We would later on input this information into digital model and relax the form with fabric under differentloads. 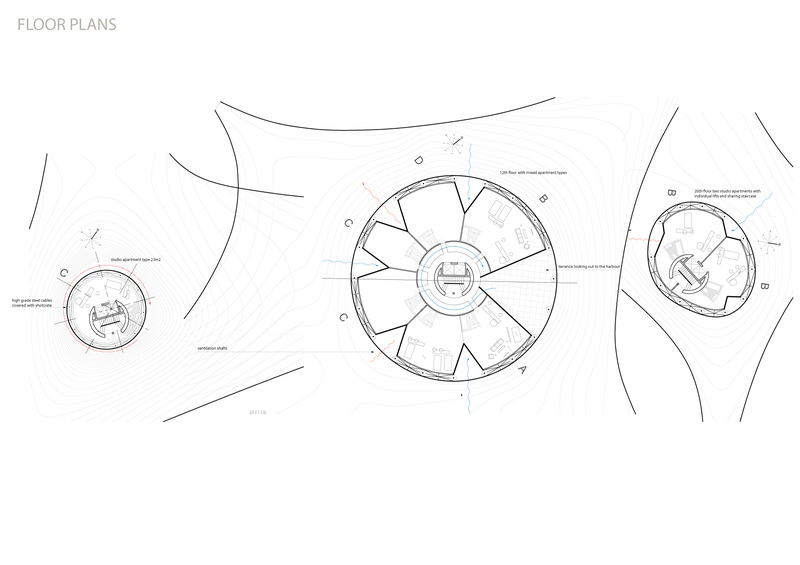 Image on the lower right presents a simplified configuration developed as a single inhabitable space. 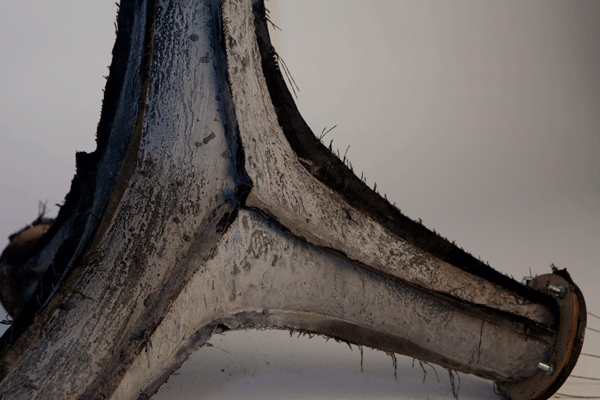 Detail of the parametrically controlled tension and thickness of the nodes. Digital model and software analysis helped us to calculate stresses and amount of steel cable reinforcement running through the structure. Pepakura programme automated the unrolling process. Each piece was projected on the wall, traced onto a fabric, cutout, pinned, sewn together and tensioned with the cable net and disks. 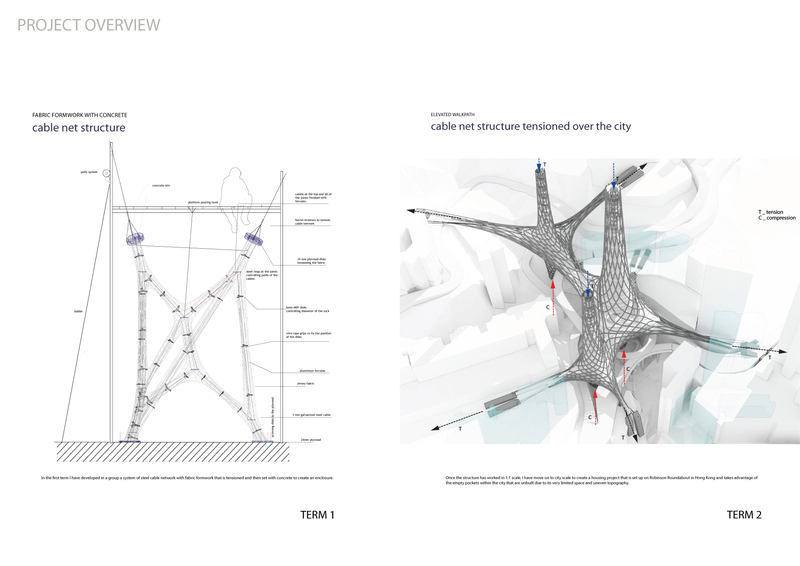 The final structure at the library terrace of the AA shows the transition from flexible tensioned cable network to rigid self supporting element.The image shows the challenges we faced when dealing with liquid concrete. We discovered lots of things to improve in the design. As our ambition was to address the problems that are experienced by a large part of the worlds population, in the second term I started thinking about the possibilities for deploying the cable net design at larger scale housing. I looked at lightweight tensile structures of Freii Otto, Olympic Stadium in Munich; large span suspension bridges that can stretch over 1000m and more domestic scale like Okanogan shotcrete over steel cable nets dwellings. My interest focus on tensioning rather than casting. Continuing within the position against traditional linear processes where development comes after design, I applied my integrated model at a site in Hong Kong where tightly zoned estates mainly accessible by sprawling highways have been jammedinto the middle of this densly packed city, leaving pedestrians to navigate around streets designed for cars, not for people. 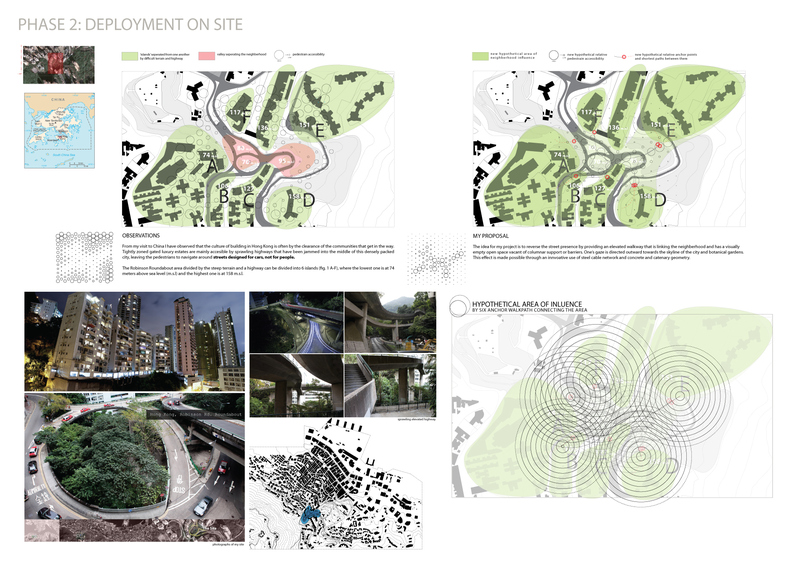 The idea of the project is to reverse the street presence by providing a connection platform that is linking the neighbourhood and has a minimum impact on nature.One’s gaze is directed outward towards the skyline of the city and botanical gardens. This effect is made possible through an innovative use of steel cable network. 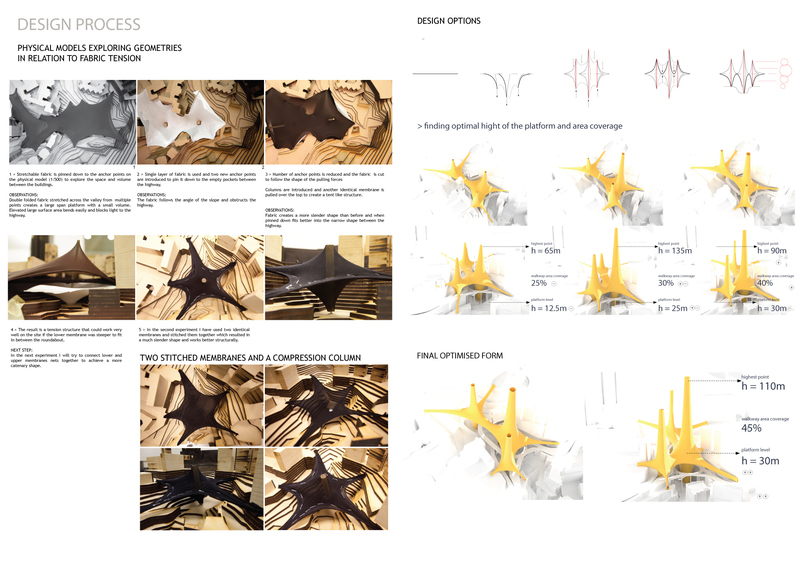 Through the physical model of the fabric in tension on my site and digital simulation Iwas exploring different design options – optimal height of the platform, walkway area coverage and the highest point of the towers. 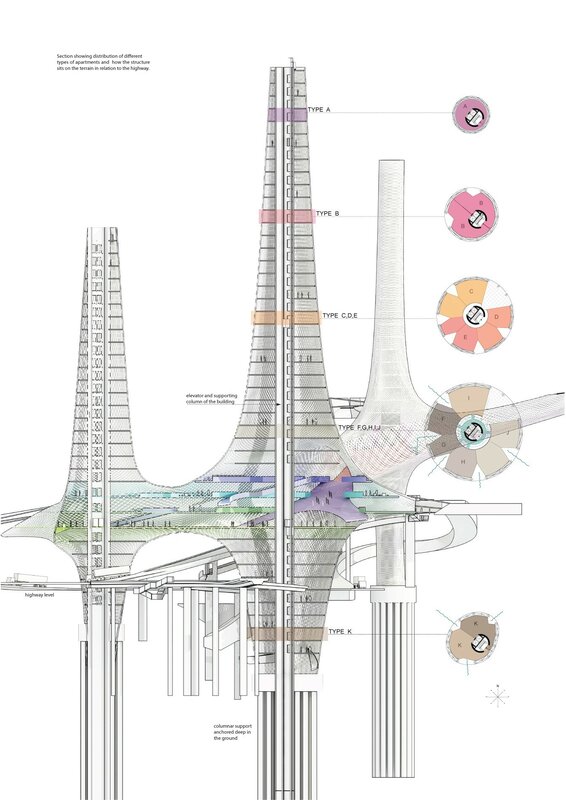 Thinking consciously about the figure of the building on the landscape and in particular the profileas it meets the ground the form is defined by lower and upper membranes intension with a compression rods in between acting as elevator shafts. This small footprint housing project set on Robinson Roundabout in Hong Kong takesthe advantage of the empty pockets within the city that are unbuilt due to itsvery limited space and uneven topography. 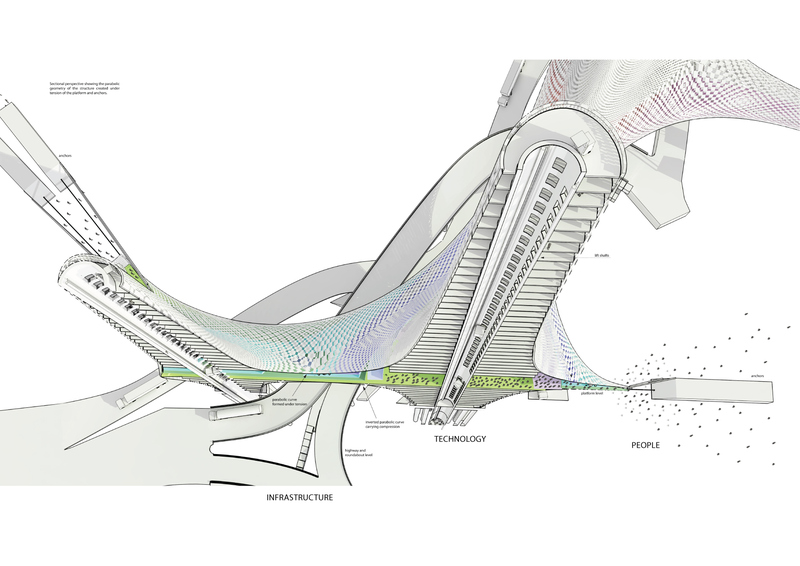 The form driven by the programme creates a platform for local people to connect above the highway which isdividing the neighberhood. So it connects existing programmes, it is mixing different social groups and also ads new programmatic elements like libraries, gym and café bars highlighted by different colours. Studio apartments and multiple bedroom flats are organised radially from the core. Vertical channels integrated into the envelope allow for natural ventilation and accessto light. While embeded terrace on lower levels take advantage to views on the harbour. The elevator shafts are constructed first using climbing formwork, then combination of steel cable net is embedded to the mountains. And gradually changing platforms are supported both by the cores and the envelope. This is a section drawing of the overall connecting building. With highlightedcolour is the public zone and commercial programme. Entrance lobbies in thecores enable access for apartments above and below the platform. Because of thenatural form that net has taken it results in gradual change in section. Thisimage again shows the connection to the surrounding infill, 3 dimensional site,anchoring into the mountains. Space is created by vertical elements thatseparate the net apart. Flexible cable steel network is set with concrete intoself-supporting rigid structure. The building through innovative thinking is consciously linking the landscapewith infrastructure technology and people.